Hair! We finally have a full head covering of hair! 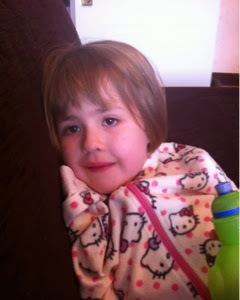 Oh it has been such a long time coming, this time last year my little one was bald as a coot, but not any more! Admittedly it is still in that weird baby mullet style, but soon, soon my friends, I will be able to apply hair ornaments! Ha! Biscuit looks sympathetic in this picture, smiling because she feels it's polite. Wearing her new Frozen "sisters" t shirt, which she pretty much refuses to take off. Such pretty brown eyes.